Fly through the water with our newest junior competitive goggle. Created with flexible unibody frame these low-profile goggles feature curved lenses that maximize underwater vision for a clear path to first place. A soft unibody frame offers optimal comfort while a dual head strap ensures a stay-put fit. Designed for kids ages 6-14. Circuit goggles are versatile goggles designed with an arched nose-piece that allows free movement of the silicone eye gaskets, creating the most comfortable goggle. This Circuit Clear Mirror from Finis focuses 100% on providing customers with the safest and highest quality gear available. The Aqua Sphere Kayenne goggle is now available with silver-mirrored lenses for bright conditions. The ultimate goggle for intensive swimming and triathlon: Optimal vision with no water flowing over the lenses, 3D gasket for the best fit and comfort. Engineered for both competition and training, the low profile design of the Blackhawk Racing swimming goggle ensures a close fit with minimal drag. Lightweight and streamlined, the Blackhawk's watertight construction includes Durafit Silicone gaskets, wide peripheral range and five removable nosebridge size options. Includes full UVA/UVB protection. Updated to handle the demands of competitive swimmers, the NR2 features a low-profile design perfect for racing and training. The liquid silicone injected gasket enhances a classic, dynamic fit that is soft and secure. The lightweight and compact frame is joined by a premium engineered anti-fog lens that delivers razor-sharp optics. An iconic goggle now in blueseventy distinctive style. The classic swedish pool racing design has been paired with a flat profile strap attachment and locking adjustment clip. The no-gasket design rests securely in the eye socket. For your convenience the Nero Elite comes pre-assembled with an additional string and nose bridge for a customized fit. The newest member of the legendary Cobra goggle family, the Cobra Core’s design features the same incredible hydrodynamics and extended lateral vision as the Cobra Ultra in a comfortable and streamlined design. This Womens low profile swim goggle from Speedo features soft silicone gaskets and headstrap. Anti-fog, polycarbonate lens have a pearlescent mirrored finish and UV protection. Interchangeable nose piece with 4 different sizes for custom fit are included. The Arena Cobra Ultra's sleek shape makes it the ultimate racing goggle for athletes who want to perform at their best and be better than the rest. These sleek, low-profile goggles give you the comfortable fit and wide range of vision you need to work through a long session in the pool. This is the original reputable Swedish goggle by Malmsten. Comes disassembled for a super customized fit. The Aqua Sphere Kaiman EXO Swim Goggle updates the highly successful Kaiman goggle with EXO-Core technology and newly designed buckle systems, in addition to anti scratch and anti fog technology. 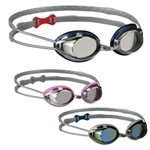 The Dart Goggles are the classic racing goggles designed for competitive swimmers. The low profile lenses sit comfortably around the eye and the traditional hard frame design gives swimmers a leak proof seal. The Stealth Goggles come with a nose piece and string that are used for a personalized fit. Performance racing goggle with anti-fog shatterproof lenses, UV protection, 3 nose piece options, silicone gasket, adjustable double silicone headstrap, and metallic coating. The Cobra is a hydrodynamic racing goggle, FINA approved and low profile high quality gaskets. Comes with 4 nose bridges for a custom fit. The Aqua Sphere Kaiman swim goggle offers 180-degree, wide-angle vision technology in a two-piece competitive-style swimming goggle. The element combines the comfort, all round visibility and fit demanded by the open water swimmer with the low-drag small socket feel a competitive pool swimmer expects. Includes two pairs of Malmsten Swedish Swim Goggles: one regular and one mirrored. The Speedo Vanquisher 2.0 Plus features updated styling from regular Vanquisher Plus goggle with ultra low profile design and 25% more peripheral vision. As well as being the official goggles of the FINA 10km Marathon Swimming World Cup, the Vision goggle is perfect for all competitive and training environments. The Vision has firmly established itself as the number one choice for open water and triathlon competition swimmers.